Mathias Thömmes is the earliest ancestor of the Fairfield County, Ohio Thimmes family to come to America. Mathias is the son of Matthias Thömmes and Anna Maria Meyer. He was born on 15 Oct 1781 in Gräfendron, Bernkastel, Rheinland, Prussia now known as Grafendhron, Landkreis Bernkastel-Wittlich, Rheinland-Pfalz, Germany. On 2 Feb 1804, Mathias married Maria Eva Thömmes (21 Oct 1779-21 Feb 1837), the daughter of Peter Thömmes and Katharina Jung in Schönberg, Bernkastel, Rheinland, Prussia. Per the Familienbuch von Schönberg Neunkirchen von 1637-1899 (Family book of Schönberg Neunkirchen from 1637-1899), Mathias and Maria Eva had 9 children. * NOTE: It was the custom at that time that if a child died young, a subsequent child would be given the same name. 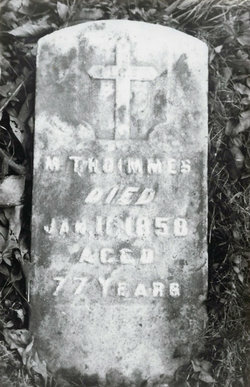 Mathias Thömmes is buried at Our Lady of Good Hope Cemetery in Hocking County, Ohio, just west of Sugar Grove, Fairfield County, Ohio. Over the years, there have been many different spellings of the family name. The original spelling, found on German records, is THÖMMES. On emigration records, filed in Trier, Germany, the family name is written THOEMMES. This is a German variation used when writing an umlaut Ö. Since English language does not use umlauts, sometimes the spelling gets changed to accommodate the way the name is pronounced. 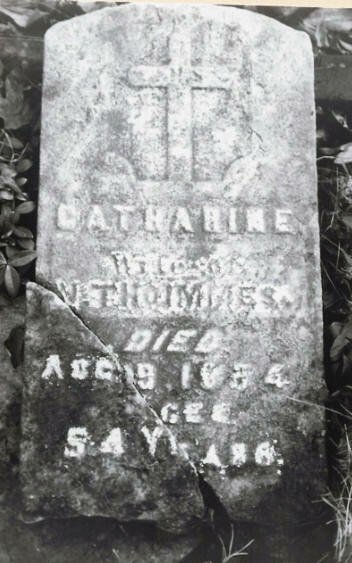 This is most likely the case with the spelling found on the gravestone of Mathias THOIMMES. In 1958, Paul Angus McLeod (the GG Grandson of Mathias Thömmes) compiled the "Thimmes Family History". Paul noted that the original German spelling was THOIMMES. Most likely, he obtained this spelling from Mathias’ gravestone. Other variant spellings are found on various documents including: Thomas, Timmens, Times, Thimmis, Thimmas, Thimes, Thaimmis & Tinnes. These variants most likely originated when a scribe wrote the name on a document of what they heard or thought was the spelling. Eventually, the Thimmes spelling became common and Mathias' direct descendants continue to spell the name THIMMES. It is believed that Mathias Thömmes migrated from Germany to Ohio at the same time as his son, Nicholas, in 1840. Mathias' wife, Maria Eva, died on 21 February 1837 in Schönberg, Bernkastel, Rheinland, Prussia. Per the German emigration records kept at Trier, Germany, Mathias' son Nicholas, his wife Catharine, and their 9 children left for America in 1840. "John H. Thimmes was born in the city of Lancaster, November 1, 1853. His father, Mathias Thimmes, was a native of Baden, Germany where his birth occurred on the 24th of April, 1831. He was in his eleventh year when, in April, 1842, he was brought to the United States by his parents, Nicholas and Catherine (Snider) Thimmes, who on crossing the Atlantic to the new world took up their abode on a farm in Fairfield county, Ohio..."
* The Thimmes Family History points out that a nurse dropped Sara Cecelia and the fall caused her death in 1868. In the 1870 U.S. Census, both Mathias Thimmes and his oldest son, John Henry Thimmes, listed their occupation as "butcher". According to the 1880 U.S. Census, Mathias' sons Christian, Charles, William and Frank were also in the butchering business. They all were listed with the occupation of "butcher." According to The Biographical Record of Fairfield County and Perry Counties, Ohio, published in 1902, pages 214-216, John Henry Thimmes began to assist Mathias at the meat market at the age of twelve. Faithfulness to duty and strict adherence to a fixed purpose in life will do more to advance a man's interests than wealth or advantageous circumstances. The successful men of the day are they who have planned their own advancement and have accomplished it in spite of many obstacles and with a certainty that could have been attained only through their own efforts. 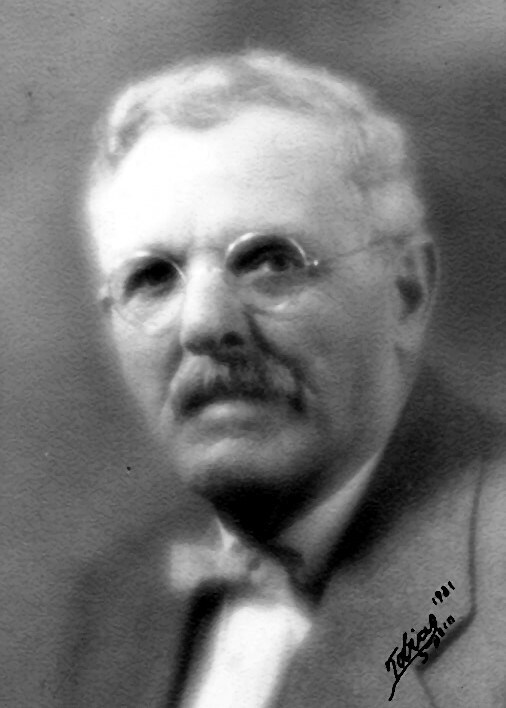 This class of men has a worthy representative in John H. Thimmes, who as a member of the firm of Thimmes Brothers, is engaged in the "wholesale and retail shipping and pork packing business. They are also proprietors of two meat markets in the city of Lancaster and the business has assumed extensive proportions, calling forth keen discrimination, capable management and untiring industry in its conduct. John H. Thimmes was born in the city of Lancaster, November 1, 1853. His father, Mathias Thimmes, was a native of Baden, Germany where his birth occurred on the 24th of April, 1831. 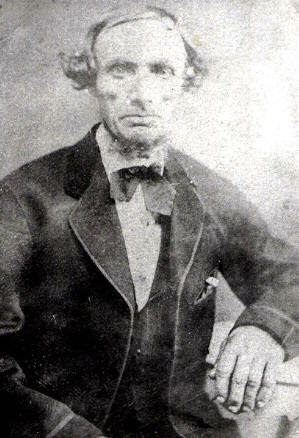 He was in his eleventh year when, in April, 1842, he was brought to the United States by his parents, Nicholas and Catherine (Snider) Thimmes, who on crossing the Atlantic to the new world took up their abode on a farm in Fairfield county, Ohio, where they resided until called to their final rest. Mathias Thimmes, the father of our subject, was reared upon the home farm and on leaving the parental roof learned the butcher's trade in Lancaster. He afterward opened a meat market in this city and in connection with its management began dealing in live stock, hogs and cattle. He carried on his own butchering and often bought and sold for parties in the east. His business reached quite extensive proportions, becoming one of the leading commercial interests of this city. In August, 1851, in Lancaster, Mathias Thimmes was united in marriage to Louise Oatney, of this city. 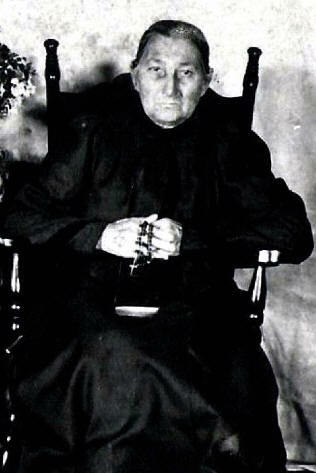 She was born in Fairfield county in February 1832, a daughter of Benedict and Christina (Houserine) Oatney. She is the only surviving member of his father's family with the exception of Mrs. Emma T. Sheffer, of Fairfield county. Unto Mr. and Mrs. Thimmes were born fourteen children: John H. of this review; Benedict, who died August 3, 1858; Christ C., born May 6, 1857; Charles N., born August 4, 1858; Louisa, born March 3, 1866, and now the wife of J. P. Miller, a merchant of Columbus; William E., a butcher, who was born March 22, 1862: Frank D., born December 14, 1863; Mary E., born October 18, 1865; Sarah E., born February 12, 1867, and now deceased; Maggie L., who was born January 19, 1869, and is the wife of Ed Brown, a merchant tailor of Indianapolis, Indiana; George Mathias, who was born November 17, 1871, and is engaged in the butchering business; Emma G., born December 12, 1873, and now the wife of Henry McLeod of Danville, Illinois; Clara Philomina, born March 8, 1876; and Joseph F., born June 27, 1877. The father of this family died in September, 1893, but the mother is still living. He was a Democrat in his political views and was a devout member of St. Mary's Catholic church, to which Mrs. Thimmes and all her children and grand-children also belong . John H. Thimmes, whose name begins this sketch, was educated in the parochial schools of Lancaster, and at the age of twelve years began to assist his father in the meat market, which had been established in 1848, and was conducted by his father until 1877. Our subject continued to assist in the conduct of that enterprise as an employee until his twenty-first year, when entered into partnership with his father, the connection being continued for four years. On the expiration of that period our subject purchased his father's interest in the market, continuing business alone for three years, when he entered into partnership relations with his two brothers, Christian and Charles W., under the firm name of Thimmes Brothers. They are now carrying on an extensive butchering business and have a large building, which was erected for packing, smoking and curing of meats. There is also a cold storage in connection and the members of the firm are extensive buyers and shippers of hogs and cattle. They also feed large numbers and handle annually about thirty thousand hogs and a large number of export cattle, which they buy and ship to Baltimore, Maryland, their principal hog markets being Pittsburg, Pennsylvania, and Chicago, Illinois. The business has now assumed extensive proportions and annually brings to the partners a handsome financial return on their investments. John H. Thimmes, of this review, has been married three times. He first wedded Mary Bodenheimer, of Fairfield county, by whom he had seven children, namely: Loretta, Leah, Silas, Annie, John, Mary, and Rachel. There were no children by the second marriage. For his third wife Mr. Thimmes chose Helen Winters, the widow of Mr. Breslin. Our subject, his wife and children are all members of St. Mary's Catholic church. They have a very fine residence modern in all its appointments and supplied with all of the comforts and many of the luxuries which go to make life worthy the living. In addition to his city property Mr. Thimmes owns a fine farm of four hundred acres, where he raises cattle and hogs and where the fields are under a high state of cultivation. His life has been one of continuous activity, in which has been accorded due recognition of labor, and today he is numbered among the substantial citizens of his county. His interests are thoroughly identified with those of the northwest, and at all times he is ready to lend his aid and co-operation to any movement calculated to benefit this section of the country or advance its wonderful development. Thimmes Family Descendant Book (1781 - Present) - a privatized (dates & places of living people omitted) 8 Generation Descendant Book (PDF), starting with Mathias Thömmes - 52 pages plus index. For more information on Louisa Oatney and Mathias Thimmes, visit the Sketch of Louisa Oatney Thimmes.